With the conclusion of Siege also came the end of the modern Avengers and an era for the publisher. To commemorate the beginning of "The Heroic Age," as Marvel has already dubbed it, they've relaunched the entire fleet of Avengers books, shuffled their rosters and even let the metaphorical sun peek its way through the clouds again. That new direction begins right here with a new team, a new first issue and, naturally, a new threat. As the active transition point from the nightfall of the last decade to the dawning of a new epoch over at Marvel, it shouldn't be much of a surprise that a large part of this issue is spent on establishing shots, cameos and introductions. It also shouldn't be that shocking to see that the tone is very noticeably different from what we've seen from the Avengers family of late. Missing are the dark corners, back alleys and secret hideouts that served as scenery for the majority of New Avengers and Dark Avengers, with the public adoration and round-table discussions that have more traditionally been team mainstays taking their place. In a lot of ways, this issue feels like a major league throwback to an era when the skies were always shiny and our heroes always wore a smile. It's like the kind of dreams I'd imagine a comic nerd like you or I having if they fell asleep in a time machine aimed at the 1960s. Bearing that in mind, it's also worth mentioning that Brian Michael Bendis has his fingers in every panel of this issue – particularly (and predictably) in the conversations that drive it. The story is a sort of half-breed; an old school, chest-puffing superhero team-up with modern off-the-cuff dialog. In that way, it's got a lot in common with the first arc of Mighty Avengers, when the pro-registration heroes still enjoyed public adoration and government appreciation before Norman Osborn took over. That's quite a change in scenery from where we stood just last month, but Bendis does a good enough job of reminding us that a lot's changed for these characters since then. He also doesn't ignore the trials they've endured nor the bridges they've burned. Particularly interesting are the few panels shared by Steve Rogers and Tony Stark, whose tenuous relationship is the heart of this team. Bendis doesn't wait long before he throws the team right into a conflict, but what time he does spend elsewhere is wisely invested. Those icebreaking moments are vital to convincing his readers that this team could actually work, even after all they've been through and everything they've said and done to one another. Looking to guarantee the new series gets off on the right foot, Marvel has assigned a resident legend to handle the artwork, studio mainstay John Romita Junior. Romita's had his ups and downs over the years, but one constant is that the titles he's on generally tend to be important, either because they're legitimately big events or because his name value gives them that extra nudge toward "can't miss" territory. In this case, he nails both targets. Although his weak cover artwork may not give any indication, this issue is one of his most complete showings in recent memory. Romita's really taken the time to make this premiere shine, whether he's fleshing out a landscape with detailed background scenery or blowing us away with the payoff to a powerful action scene. His work doesn't seem as loose and carefree as it's been lately, and such a return to form couldn't have happened in a better place. I'm tempted to announce JR Jr. is back, but that would suggest he'd gone away in the first place. Maybe it would be more appropriate to say he's awoken from hibernation. 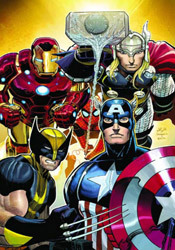 This issue is good news for Avengers fans of all shapes and sizes. It's got the colorful veteran roster, cosmic scale and heavy-duty feel of the most classic Avengers stories and the lighter dialog, quicker plot and ongoing continuity of the more recent stories. Bendis does occasionally stick a distracting word or two in an unexpected place, but his first test drive with the new team makes for a great ride and John Romita, Jr.'s artwork looks as good as it ever has. Buy it.